Marking Fairtrade Fortnight at Lagan Valley Island are (l-r) Ricarda Stienhaus, Fairtrade Ireland; Councillor Uel Mackin, Chairman of the council's Development Committee; Dr Chris Stange, Secretariat of the All Party Group on Fairtrade, Stormont; Melanie Drea, Fairtrade Ireland and Heydi Janeth, Fairtrade Producer, Nicaragua. Lisburn and Castlereagh’s bid to secure Fairtrade accreditation is gaining momentum across the local community, according to the council. To celebrate Fairtrade Fortnight, the local authority recently invited guest speaker Heydi Janeth, a Fairtrade factory worker from Nicaragua, to talk to students about the huge difference Fairtrade makes to the lives of the farmers, their families and communities. More than 150 local schoolchildren attended the event at Lagan Valley Island where they got the opportunity to learn more about the importance of Fairtrade practices, both at home and abroad. 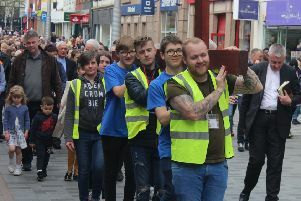 Speaking at the event, Councillor Uel Mackin, Chairman of the council’s Fairtrade Steering Group, said: “We have had a positive response to our campaign to achieve Fairtrade status for the city. A significant percentage of business organisations, education establishments, restaurants and cafes already support Fairtrade. During the event, which was supported by local branches of Lidl, the Co-op and Tesco, Knockmore Primary School delivered a short presentation to share what they do as a Fairtrade Accredited School to empower students and support Fairtrade. Encouraging more people to join the Fairtrade Steering Group, he said: “Anyone with an interest in Fairtrade is very welcome to join us. Please contact clora.gallagher@lisburncastlereagh.gov.uk to find out more.